Jacob & Co. is best known for its ostentatious, bejewelled timepieces beloved by musicians and sportsmen. 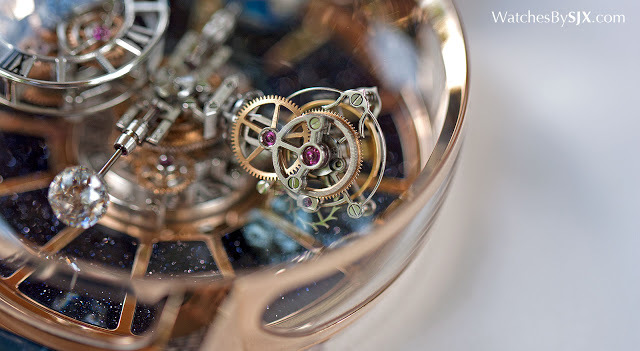 The Astronomia, in contrast, is an entirely different kind of watch. It’s an orbital, double axis tourbillon combined with an orbital time display, powered by a movement rendered in three-dimensions that rises up from the baseplate. Impressively visual on the wrist, the Astronomia movement is constructed vertically, rather than horizontally as with conventional movements. A unique and imaginative construction, the movement was developed by Studio 7h38, a specialist movement developer that’s also responsible for completing the entire watch. 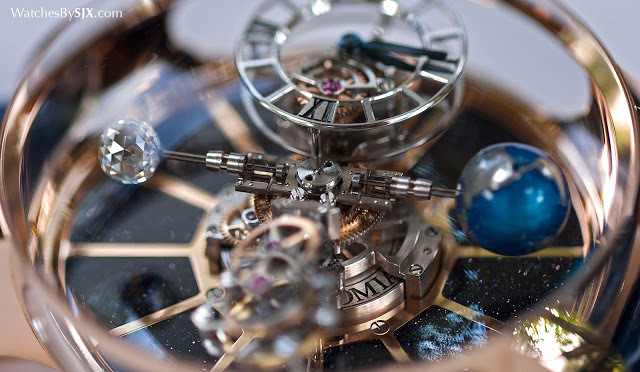 Led by watchmaker Luca Soprana, the firm’s other works include the Vianney Halter Deep Space Tourbillon. The movement sits in the centre of the watch, surrounded by panels of aventurine, a form of quartz with sparkling mineral inclusions that mimics the night sky. Right at the bottom of the movement is the barrel, containing the mainspring that powers the movement. The gear train sits on top, with the entire display mechanism branching out from the centre. Four functions are displayed three-dimensionally, each in a fixed position relative to each other, but with the entire mechanism making a 20-minute rotation. It relies on planetary gears to keep everything moving simultaneously around the case. The simplest element is the globe, made of aluminium and lacquered in blue. Making one revolution a second, it functions as a seconds hand. Directly opposite the globe is a one carat diamond that acts as a counterweight. Completely spherical, the diamond is cut with 288 facets, a Jacob & Co. patent. The tourbillon is a double axis tourbillon, or triple axis if you count the 20-minute revolution of the entire mechanism. The tourbillon cage makes one revolution a minute on the same axis as the balance wheel, and a five minute rotation on the axis perpendicular to the balance. Equally, or perhaps more, intriguing is the time display mechanism. The sub-dial showing the time, with an open-worked chapter ring for the hour markers, is always the right side up, even as it travels around the case on its 20-minute rotation. That means the “XII” marker is always at 12 o’clock, regardless of where the sub-dial is inside the case. 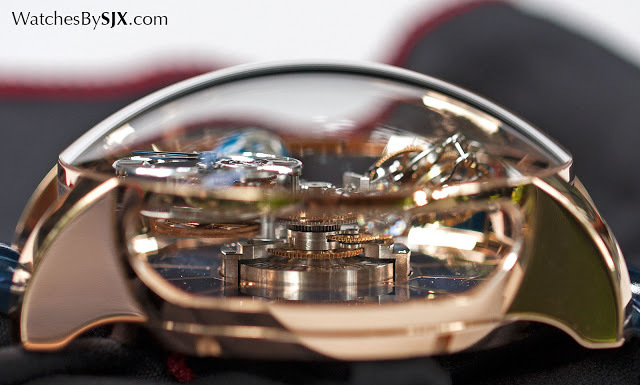 The remarkably dynamic and tangible movement sits inside a case that is as much sapphire crystal as it is rose gold. Panoramic windows on each side, including in-between the lugs, reveal the entirety of the movement. 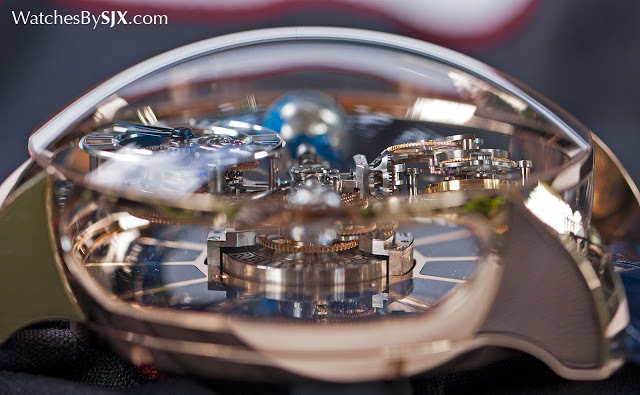 And it’s topped by a vast, domed sapphire crystal. 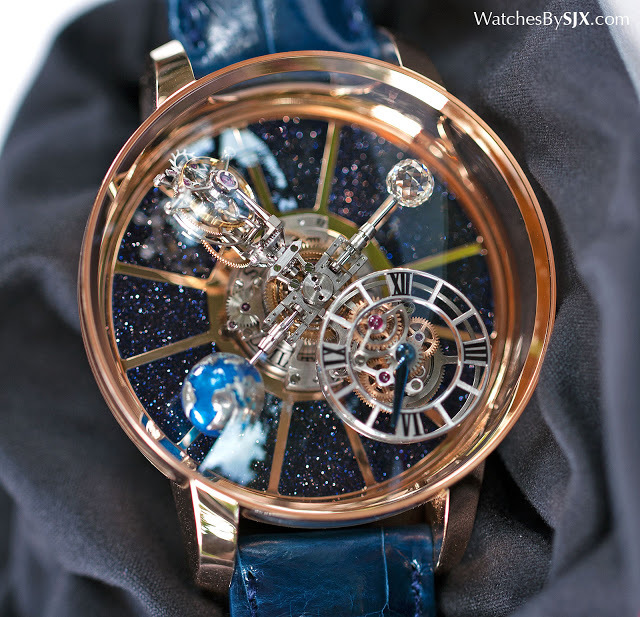 All of that means the Astronomia is enormous – a Jacob & Co. watch could hard be anything else. It’s 50mm in diameter, and some 25mm high. Few watches are as necessarily large, but this one certainly requires its ample volume for full visual impact. 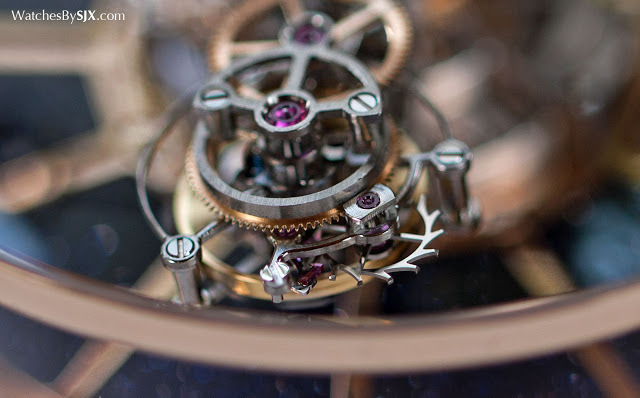 The novel movement construction means that there is no crown on the side, instead two crowns are set into the back of the watch, one for time setting and the other for winding. On a full wind it manages a respectable 60-hour power reserve, despite the relatively small barrel. 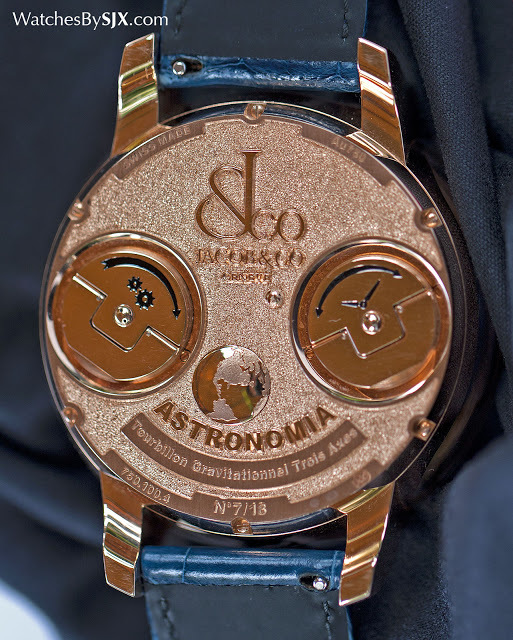 The Astronomia is a limited edition of 18 pieces in pink gold, and another nine pieces with 16 carats worth of diamonds, specifically 342 baguette-cut diamonds. The plain, if it can be called that, version is priced at US$540,000, while the diamond-set model is US$1 million. In Singapore the price is S$818,000 for the first one, and upon request for the second.